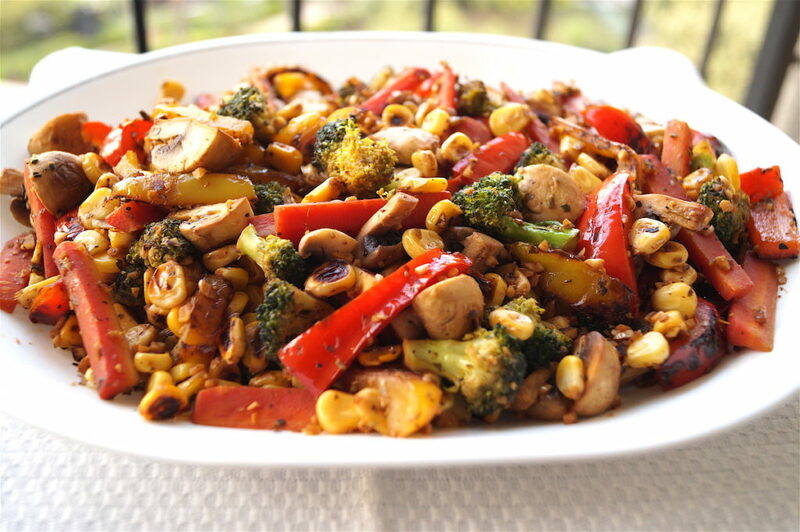 Here’s another take on stir-fried vegetables. There are not too many ways to make vegetables taste very different and keep them free of honey or sugar or cheesy or creamy additions that make them taste awesome and one can only play around with condiments and combinations. 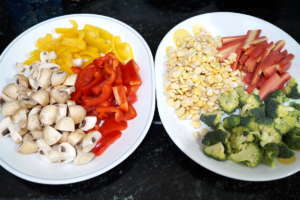 Here is my attempt at making a whole bunch of healthy vegetables taste a bit different as well as be palatable. I’ve used dried mint here but you can even use fresh mint leaves chopped very finely. The fennel seeds was an addition that came after I smelled the dried mint and immediately thought that fennel would complement it in some weird manner. I tried it once and loved the taste so thought I’d share the new flavour combination with the rest of the world. This is a fresh and super healthy combination with olive oil being the only processed item. 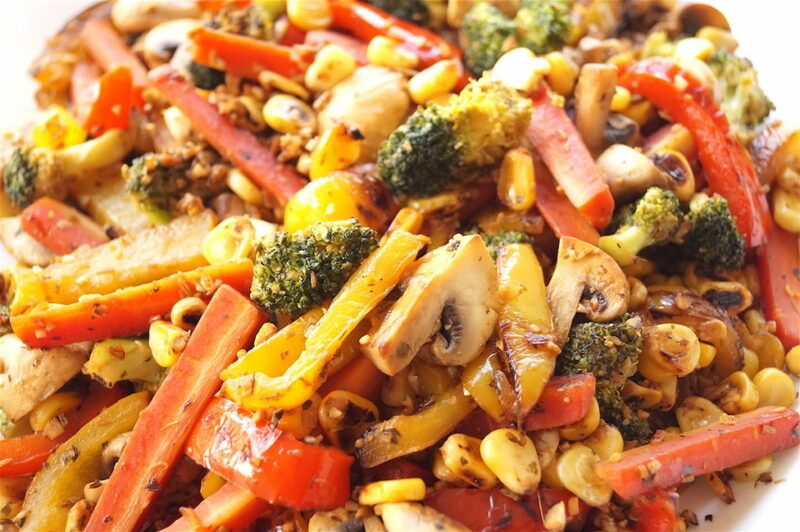 They say that the more colourful the vegetables, the healthier they are, and this dish takes on almost rainbow hues! For vegetable lovers, this would be a wonderful plate of food and you can combine it with a cottage cheese steak or chickpea cutlets or just have a whole bunch of it on its own. Non Vegetarians can compliment their steaks or grilled meats and seafood with this. 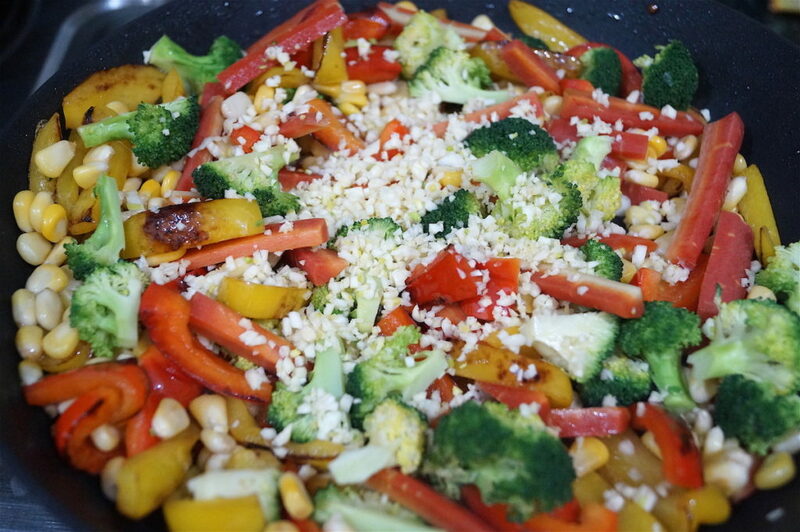 My kids who gag at the thought of bell peppers got them removed and were not so unhappy with the broccoli, carrots, mushroom and corn, and getting them to eat even that was a feat. When I asked them how they liked it, the son scrunched up his nose and said “even though I hate broccoli and mushrooms, the flavour is nice’’. Well, that was encouraging. The husband? Don’t even ask. He hates veggies period, however, he picked at the corn and the carrots, taking two pieces each and said – `nice flavour’ when pressed. This is definitely not a favourite kids dish but will find favour with anyone who loves veggies and those that are trying to cut calories. If you want children to eat red and yellow peppers then you can try making my bell pepper pasta which I’m sure they will love, and they won’t even know they are eating the stuff and it’s a great favourite with adults too. I like banging flavour so there’s a whole lot of everything in here. You can add less lemon juice and other condiments if you like. So here it is, my colourful veggie platter. Remove the seeds and the white membrane from the bell peppers and slice them into 1 cm wide strips. Blanch the carrots and corn in a pot of boiling water with 1 tsp salt in it for a minute, then add the broccoli to the pot and blanch all veggies for another minute. Remove the vegetables from the water immediately after 2 minutes and keep aside. Cut the mushrooms into quarters, heat 1 tablespoon of the oil in a non-stick pan and on maximum heat toss the mushrooms till browned. With such high heat they should not release water as long as the pan is not overcrowded. If they do release water, keep stirring them till all the water evaporates. Remove onto a plate. Heat the rest of the oil in the pan on high heat and throw in the red and yellow peppers. Char them nicely on all sides for about 1.5 minutes, then throw in the rest of the vegetables and stir them all together. Add the diced garlic to the pan and toss. Then add the lemon juice, salt, mint and fennel. Toss them all till well mixed for about another two minutes and remove from pan to a serving dish. Serve immediately. Important notes: Keep a large frying pan for this dish. 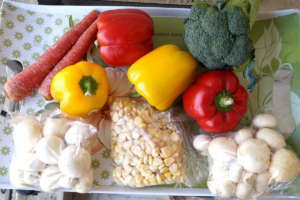 You want a nice char on the vegetables and they should be slightly crunchy and not soggy. If you overcrowd the pan you will end up with a soggy dish as you won’t get the appropriate amount of heat to the veggies and they will end up being steamed.